Back in the 80’s if i remember correctly, moonsighting reports and the dates for the beginning of Ramadhan & the Eids were unanimously agreed upon by all Masjids and Islamic Establishments throughout Britain. Well if not unanimously, we were all atleast starting ramadhan and celebrating eid together (ie. on the same day). Only 20 years later, we are in such a terrible state that in a single community some are starting ramadhan and celebrating eid on one day and some on another day. Members of the same family are also victims of this situation, where in various households all the members of one family cannot actually gather together in one place for eid celebrations etc. The problem actually started appearing in the early 90’s and has been increasing ever since. The institutions that blindly follow the announcements made by saudi, neither know why they follow their decisions nor do they care. To the run up to Ramadhan and Eid they eagerly await to here if the moon has been sighted in saudi. why..?? I ask myself. Answer is, it is due to ignorance, lack of islamic knowledge and then there are those who are willing to impose false dates in order to benefit themselves in one way or another like being leaders who can bragg about being the mastermind behind uniting all under one system (a false and corrupt system). And then there are those who will dileberately do it on a different day in order to not celebrate eid with another group of muslims, I’yadhu billah. When these people are challenged, they talk about Itihad Al-Matalee or Global Moonsighting and they use certain ayats and hadith to justify their decisions. But what they don’t realise is that the people they are blindly following do not use the global sighting formula themselves, and these individuals here in the UK and USA are not only trying to justify the adherence to saudi announcements but are actually trying to impose saudi decisions here in the west by preaching about global moonsighting. whats going on..???? i’m certainly confused. This is nothing more than a conspiracy. Propaganda concerning our ibadah engineered by muslims. And then we cry out for unity, and how the muslims are being attacked by the kuffar. Clean yourself up before accusing others of being dirty!! There is no global moon sighting authority, so this system cannot be adopted yet, but it can be adopted if there is an authority who will take on this task to gather such information and compile it and so forth, but until then its better to be safe than sorry. Ikhtilaf Al-Matalee (local moon sighting) shall remain our practice. The salafies are a minority, in no matter which country you find yourself in, but still they manage to impose their way in the community on such issues. how..?? Money!! he who has more wealth has a louder voice, and the simple folk usually adhere to what they hear most, because they neither have the knowledge nor the ability to search out the truth with established proofs. In the UK, it is because the deobandies will 9.9 times out of 10 side with the wahabies/salafies. And when being accused of being closet wahabies, they shout and scream about how they are the only group on the right path (the real adherers of the sunnah). I ask where the sunnah is in following saudi decisions..? If the deobandies followed the correct procedure (which only a handful of deobandi masjids do in the whole of the UK), you would see a large majority of muslims to one side and a minority (which they are) to another. Then they would have no alternative but to return to the haq. One can say, well if you are so concerned why don’t you just swallow your pride and just follow them for the sake of muslim unity.? In any normal circumstance this would be a wise option, but this concerns Islam and Ibadah, and we cannot adhere to falsehood for the sake of unity nor can we agree upon what we know to be false & full of error. Nor can we mix falsehood with the truth. Also if we decided to follow the erroneous way, when it comes to eid al-adha, which is on the 10th of dhul hijjah, we will actually be performing the qurbani on the 9th even though we have altered our calendar to seem as though it is the 10th, in truth it is still the 9th and qurbani on the 9th will not fulfill the wajib qurbani of the 10th. Below is a short research on the issue which deals with all the different aspects on the topic. Anyone who studies this will have no doubts remaining on the issue afterwards. Inshallah. 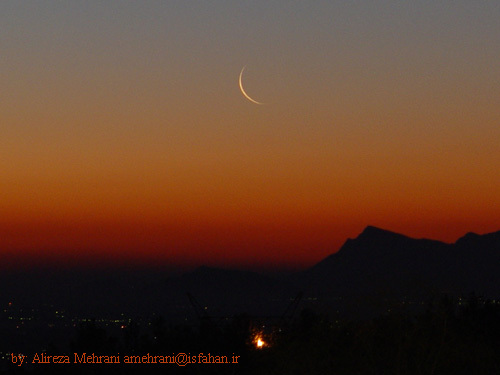 cesarean moon births , The Moonsighting debate & Deobandi and Salafi fatwas… why two eids.? … dis-united ramadan/eidain – the root cause.